Back in 2004, Mary O’Connor was awakened by a late-night phone call from the Salida post office demanding she come pick up her boxes of bees. The insects were flying around the post office and scaring the workers. She calmly refused, explaining that there may be a few extra bees outside of the box that belonged with the queen inside, and that the stragglers would happily accompany the box to Westcliffe when they delivered it in the morning. This would not be the last time Mary would find the courage to follow her own good judgment when it came to bees. Mary was drawn to beekeeping through her passion for plants. She was already an experienced gardener and herbalist, and saw bees as an integral part of the whole system. Her eyes light up when she talks about her “girls.” While male bees mostly sit around until it is time to mate with the queen, the “girls,” as Mary calls them, are the worker bees. They build the comb, tend the brood, collect nectar and pollen from one flower at a time, fill the honey comb and then fan the nectar with their wings to dehydrate it and turn it into honey. 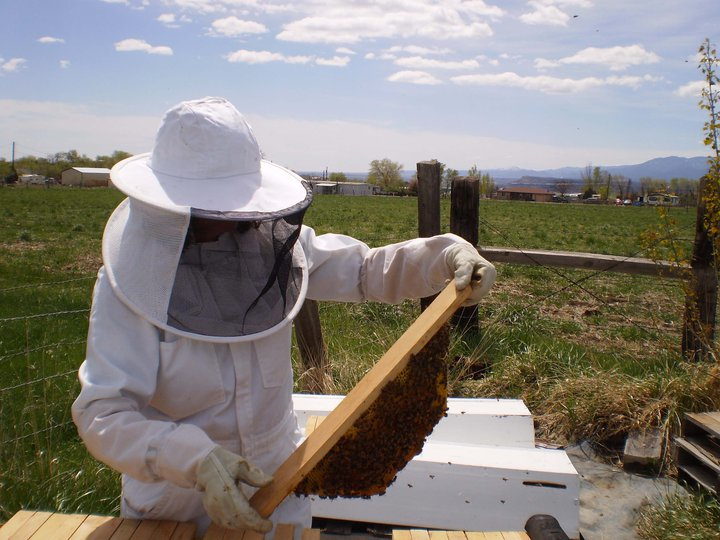 When Mary began beekeeping eight years ago, conventional wisdom said bees should be treated with chemicals to avert mite infestations and given antibiotics to prevent disease. She was also instructed to use pre-fabricated plastic combs and to harvest most of the honey from the hive supplementing the bees’ diet with sugar water. Mary knew there had to be another way. She sought out a more natural approach to caring for bees, and finally found a teacher in New Mexico practicing top-bar hive beekeeping, a method in which bees build their own custom combs and eat nothing but their own honey, which naturally supports a healthy and resilient bee population. While a top-bar hive requires more tending and yields less honey, Mary is dedicated to this enchanting process. Honey truly is a miracle product. Beyond the delight of its sweetness, honey is naturally anti-microbial and it literally never goes bad. It contains vitamins, minerals and nutrients that support the immune system. It is full of enzymes that aid in digestion, and eating local honey can even alleviate seasonal allergies. In addition to selling delicious raw honey, Mary also crafts soaps and lotions made with honey, and healing salves made with beeswax. To learn more about beekeeping or to try out some truly amazing products visit Rosita Mary at the Westcliffe Farmers Market on any Thursday afternoon through September.